A premium level of protection and durability against destructive torsional vibration. Expert torsional vibration analysis and engineering capabilities to assist powertrain OEMs deliver market leading quality. ISO 9001:2015 Design & Development certified. We offer branded replacement crankshaft dampers for heavy-duty diesel applications used in the over-the-road trucking, marine, construction, locomotive and oil & gas industries. Factory rebuild and refurbish program to extend the life of your current damper. When failure is not an option. Vibratech TVD is a proud supplier of viscous dampers to the U.S. Armed Forces & Government agencies. ITAR Registered. Designed for high power diesel engines operating under strict noise compliance. Broadest industry leading experience from high performance motorsports to massive gas compression engines. Tuned viscous dampers for drivelines, PTO shaft accessories, and starter shafts. Eliminate hybrid and full-electric driveline backlash growl. Built into every Vibratech TVD torsional viscous damper is expert torsional vibration analysis, design integration and demanding product validation. ISO 9001:2015 Design & Development certified. Vibratech TVD’s pride in craftsmanship, investment in advanced manufacturing and focus on building lasting relationships guides our determination to deliver the best product, on-time, at a competitive price. Advanced American manufacturing & global logistics capabilities. OEM supplier to the agriculture, aviation, defense, rail and trucking industries. Vibratech TVD (formerly Houdaille) invented the torsional viscous damper in 1946. It revolutionized diesel engine durability and has been widely adopted ever since. Discover our rich history, leadership in the industry, and our commitment to give back to our community while preserving the environment. 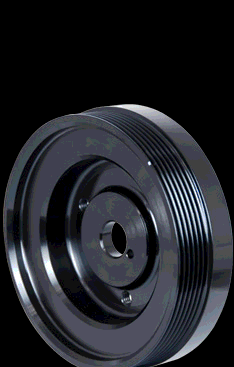 Vibratech TVD proudly manufactures torsional viscous dampers in the USA. Quality centric facility features low to high volume production capacity utilizing precision CNC machining and advanced automation. Warehousing available to meet your production schedule demands.